CaminoWays.com sister brand FrancigenaWays.com is now offering a brand new package for all walking and pilgrim enthusiasts. Walk the last 100km of the Via Francigena pilgrim trail in Italy to obtain your Testimonium certificate and experience an audience with the Pope. The Via Francigena is an ancient pilgrim trail starting in Canterbury, UK, and finishing in Rome. This trail, covering nearly 2,000km across Europe, is a European Cultural itinerary since 1994. To obtain the ‘Testimonium’ or certificate of completion of their pilgrimage to Rome, pilgrims must walk at least the last 100km of the Via Francigena – from the gorgeous town of Viterbo to Rome. FrancigenaWays.com ‘Testimonium’ package is a 7-day walking holiday which begins in medieval Viterbo. Starting at this point ensures that travellers can complete the 100km required to obtain their ‘Testimonium’ in Rome. An audience with the Pope can also be arranged on Wednesdays, free of charge. This 7-day walking holiday sees pilgrims travel along footpaths and trails across the scenic and lush Lazio countryside, passing lively small towns and villages where they can enjoy bustling markets, taste delicious Italian food and admire the region’s rich heritage and archaeology. Accommodation during the walk will be offered in the form of charming family-run country hotels and farm houses. 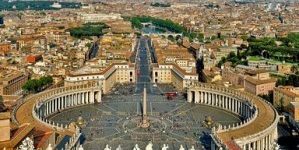 Walkers will end their journey at the Vatican in Rome, along the famous ‘Via Triumphale’, with spectacular views of Rome, the Eternal City. During this last night in Rome walkers will stay in a 17th century Monastery just 500m from St Peter’s Square. For those who are looking for that little bit extra, FrancigenaWays.com can upgrade any package holiday to 4* or 5* accommodation and agriturismos (country guest houses). They can also offer extra nights and airport transfers. This package is now available with FrancigenaWays.com from just €589pps. Families can avail of 40% off this price for children aged between 3-9 years old, and 20% off this price for children aged between 10-17 years old. Children under 3 travel free. For more information on this Via Francigena walking holiday package. Price is based on travel during mid and high season (March to October). Price includes: 3* Accommodation on a half-board basis, luggage transfers and a holiday pack. I hope this helps! Let us know if you need any additional information.